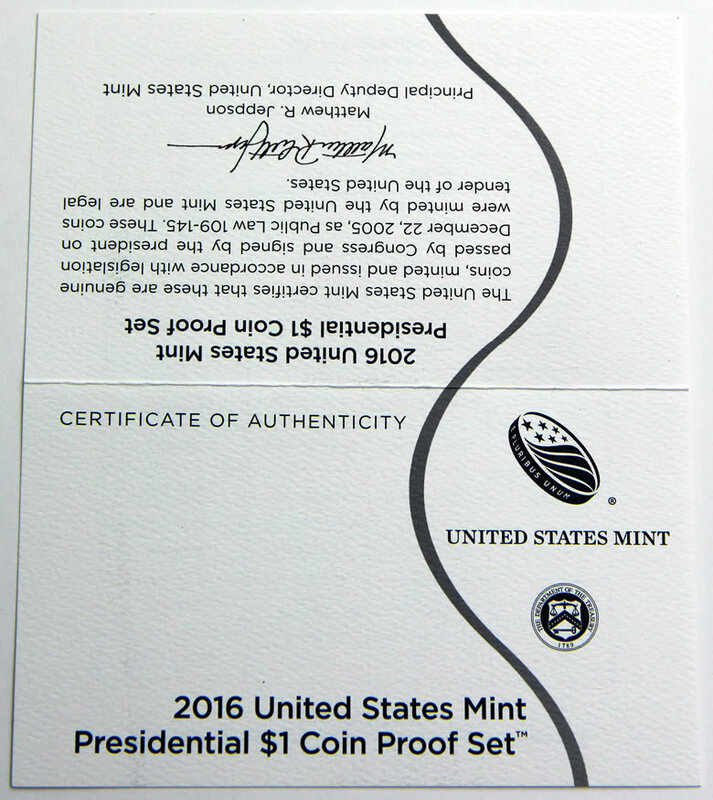 The U.S. Mint last week started selling its 2016 Presidential $1 Coin Proof Set for $17.95. This article presents photos of the set and compares its starting sales to those from prior years. 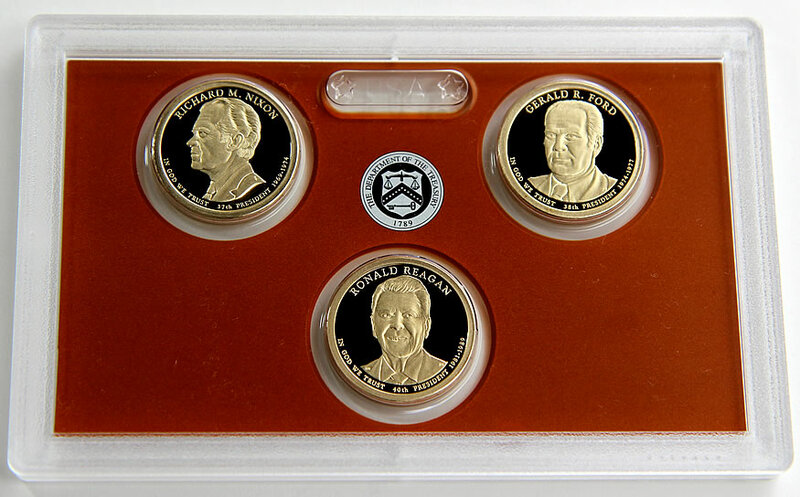 This year’s set includes proof editions of the final three Presidential dollars. 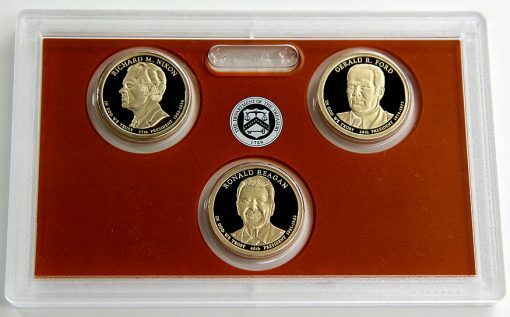 They feature frosted portraits of former Presidents Richard M. Nixon, Gerald R. Ford and Ronald Reagan that contrast against mirror-like backgrounds. 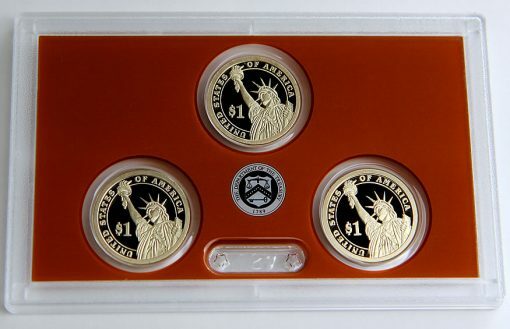 Presidential $1 Coins share reverse designs depicting a rendition of the Statue of Liberty. This next photo is of the dollar reverses. 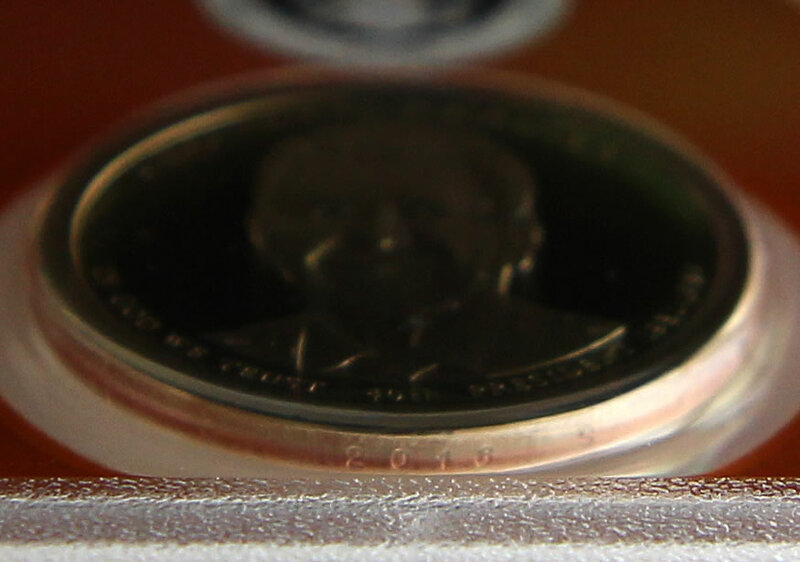 Edges of dollar coins have incused lettering for their year of minting, the motto E PLURIBUS UNUM, and a mint mark denoting where they were made. 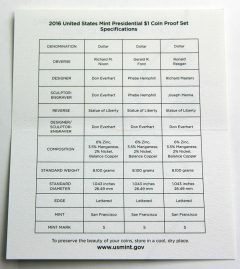 The San Francisco Mint produces proof $1 coins so each has an ‘S’ mint mark. 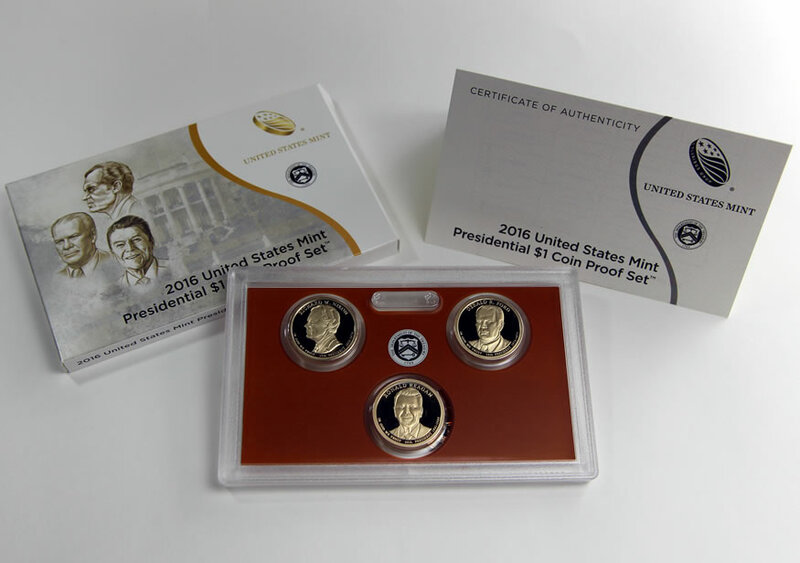 U.S. Mint products for collectors ship with a certificate of authenticity. The back of certificate lists the specifications of the three dollars to include names of their designers and sculptors. This year’s set scored opening 6-day sales of 124,420, the quickest start since the set from 2012. Final sales tend to at least double early figures, as illustrated in the table below. *Last year’s set is no longer available but the U.S. Mint continues to tweak its ending total. 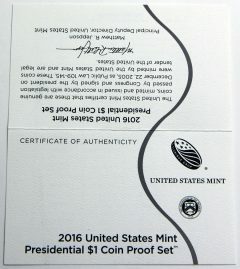 Order proof sets from the United States Mint’s online store, using this page, or call 1-800-USA-MINT (872-6468). Thank you, Mike, for all of that information. You do a wonderful job here!!! 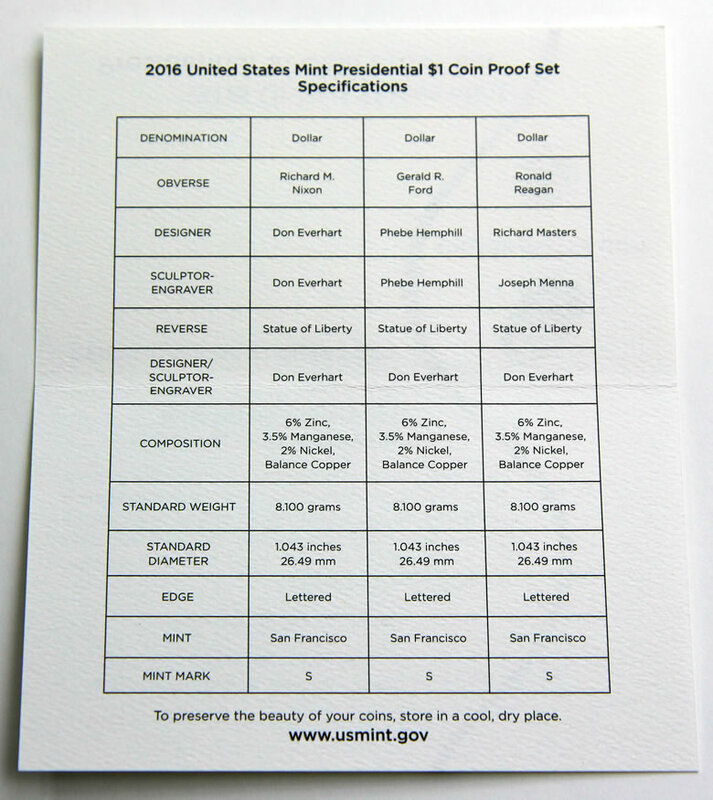 I noticed very heavy cameo frosting on 3 of the 5 sets of these Proof presidential $1 coins I ordered, even on the reverse Statue of Liberty design. I ordered on first day of issue, although that doesn’t mean they were first coins struck, we must have received some sets with coins struck by new, fresh dies. 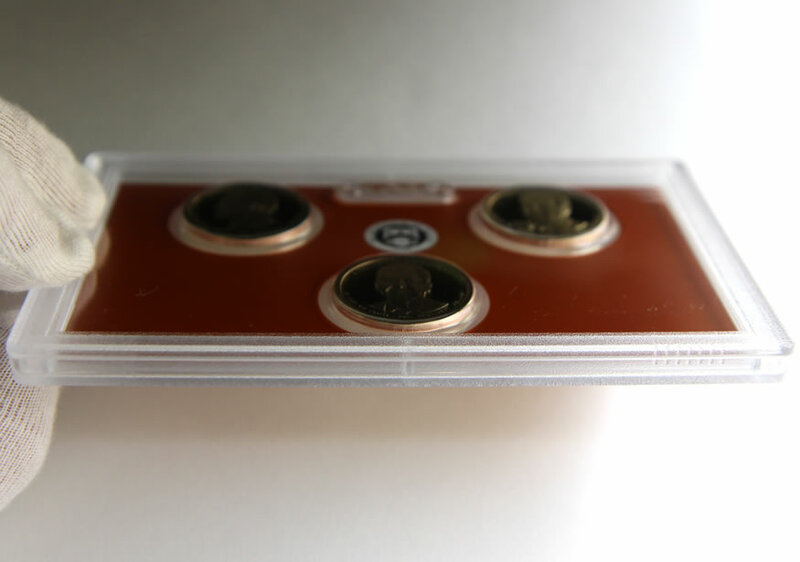 But the U.S. Mint does a pretty darn good job on most of its Proof coins since Proof set production was moved to the San Francisco Mint in 1968. That is their specialty at that branch Mint. Congrats on getting some sets that might grade Proof 70 John!